The REO Single Circuit Blasting Machines are of solid-state capacitor discharge design. 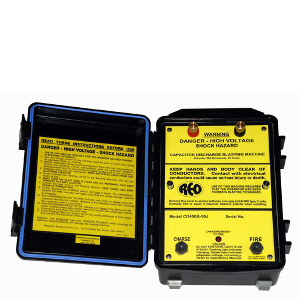 They offer a wide variety of energy and voltage choices in a series of compact, lightweight, portable, water and corrosion resistant enclosures, and are designed to provide extended service under a variety of operation conditions. [2 lbs. (1 kg.)] 4.1 x 2.2 x 3.6 in. (10.5 x 5.6 x 9.0 cm.) Eight 1.5 volt "AA"
[7 lbs. (3 kg.)] 10.3 x 7.3 x 4.1 in. (26.2 x 18.5 x 10.2 cm.) Eight 1.5 volt "AA"
[14 lbs. (7 kg.)] 9.5 x 8.1 x 6.2 in. (24.1 x 20.6 x 15.7 cm.) Eight 1.5 volt "C"
(22.9 x 20.3 x 8.6 cm.) Twelve 1.5 volt "D"
(22.9 x 20.3 x 8.6 cm.) Eight 1.5 volt "AA"
(1) 2 ohm EB detonators based on US standard detonator rating of 20 millijoules/ohm delivered in 5 milliseconds. Contact your powder company for recommendations. See SUITABILITY statement under OPERATION heading below. (2) 12 ohm maximum lead line. (3) 3 ohm maximum lead line. (4) 4 series of 50 2 ohm EB detonators. (5) 8 series of 63 2 ohm EB detonators. (6) 11 series of 91 2 ohm EB detonators. Solid-state circuitry assures excellent reliability and service life. Sturdy construction for extended service life. Rugged water and environmentally sealed to operate in most weather. Heavy-duty, long life, ALKALINE batteries provide efficient and dependable power. Fast battery change, using temperature compensated circuits facilitate cold weather operation. 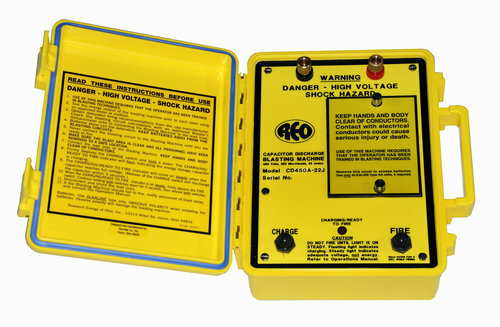 Use of this equipment requires training in blasting techniques. Contact your powder company representative for training information. Lead lines shall not be connected to the blasting machine until the circuit wiring has been verified by approved testers, the blast is ready to be fired and area safety is assured. After the lead lines have been connected to the blasting machine, depress the CHARGE switch and hold it down. 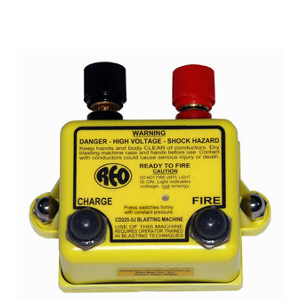 When the READY TO FIRE indicator lights, depress the FIRE switch while continuing to depress the CHARGE switch. Unless the CHARGE and FIRE switches are operated together, the machine will not fire. The amount of time it takes for the READY TO FIRE indicator light to illuminate reflects remaining battery life. After months of firing cycles, a longer charge time will be required. 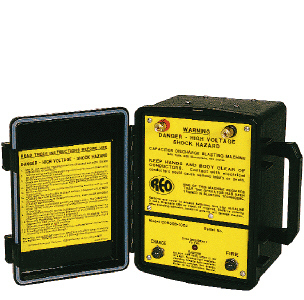 However, regardless of battery condition, the full design voltage is present and the unit's safety circuits are released if the READY TO FIRE indicator is illuminated. The two terminals are shunted until the "Fire" switch is depressed.